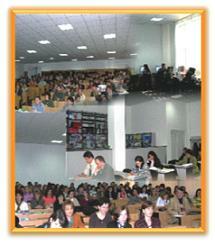 The Faculty of Economics has seen an explosive growth in recent years due to the interest of the students in this field. The organizational support of this growth was made by increasing the area of education, specifically by extending the department building. The new building doubled the existing space. The lecture room, the class and seminar rooms, laboratories, libraries and the administrative spaces, cover the needs of a modern university of the highest European standards. The main objective of the Faculty of Economics is to train experts in specialized economics and to find new solutions to the complex problems of contemporary social and economic life. The Faculty of Economics, with a term of three years of studies, full-time or reduced attendance, has four specializations: Management, Finance and Banks, Accounting and Management Science and Economic IT, that confers on future graduates solid training in the field of economics, giving viable knowledge for work in a European market with openings for the formation of new careers.